A farmer and his wife in Washington State try to figure out why their wheat field was targeted as the site of a mysterious crop circle. KHQ's Mike Perry reports. 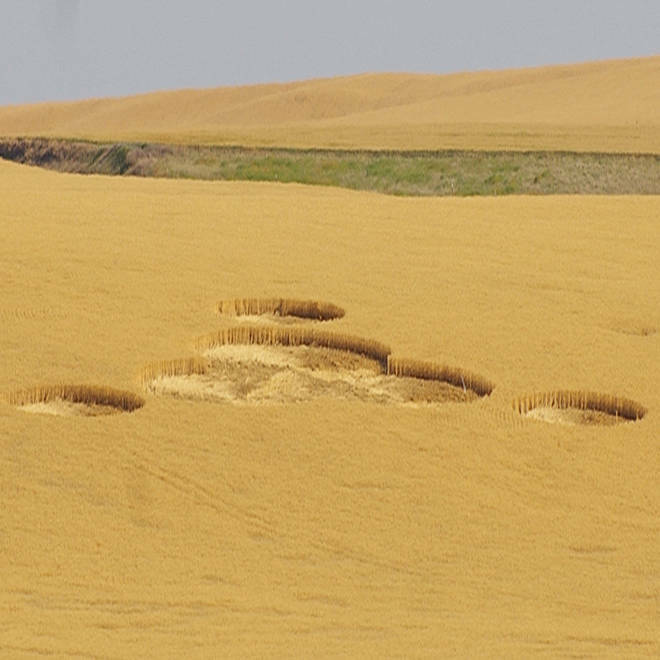 A set of crop circles appeared in an eastern Washington wheat field last week, much to the amusement of the field’s owners. The crop circles were first spotted July 24, when friends of the Geibs noticed the flattened wheat about five miles north of the town of Wilbur, Wash. The field is 10 miles south of the Grand Coulee dam, which the Bureau of Reclamation says is the largest hydropower producer in the U.S. The circles resemble a four-leaf clover. Cindy said they remind her of Mickey Mouse ears. The design knocked down about an acre of their wheat. Greg, a fifth-generation wheat farmer, is set to begin harvest next week, and he said some of the crop will be lost, but there hasn’t been much harm done. Rather, it’s more of an inconvenience when he comes to that particular section of wheat. These aren’t the first crop circles that have appeared in Lincoln County. Every year or so, a new set has appeared in one of the wheat fields, KHQ reported. Crop circles in a wheat field owned by Greg and Cindy Geib near Wilbur, Wash., on July 30. Lynne Brougher, a public affairs officer for the Grand Coulee dam, hadn’t heard about the latest crop circles but said the previous one was no cause for alarm. Cindy said those responsible for the crop circles near her home remain a mystery. Both Cindy and Greg said their family is choosing to remain lighthearted about the crop circles and all of the attention they're bringing.